The new 9-pin dock connector expected to debut with Apple's next iPhone will also cary a higher cost that is projected to push its average selling price up 84.3 percent year over year. The details were provided on Wednesday by analyst Ming-Chi Kuo with KGI Securities, who found that the average selling price of the new connector will be "considerably higher" than the legacy 30-pin design that Apple has used for the last decade. The cost increase comes from the fact that the new connector will be smaller and thinner than the current design, requiring greater requirements in precision, durability and drop quality assurance tests. In addition, Kuo revealed that each cable will be embedded with a detector integrated circuit in order to counter unauthorized accessories, further adding to the cost of the cables. 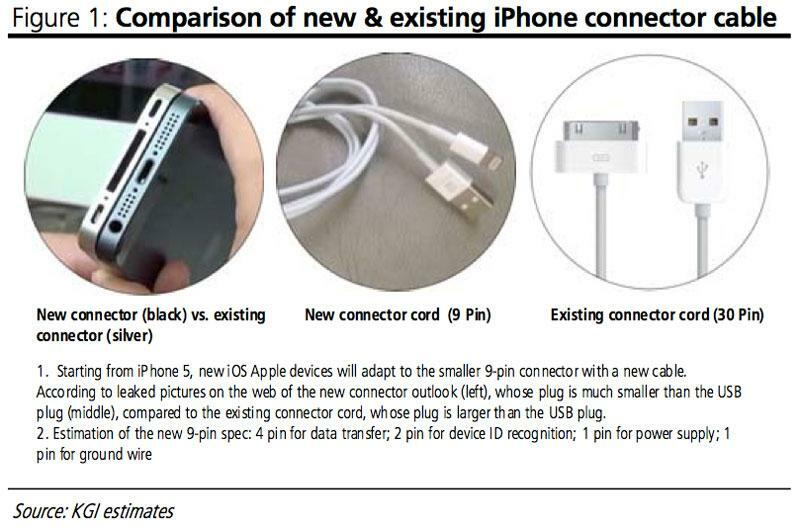 A total of five devices are expected to be compatible with the revised connector this fall, beginning with the "iPhone 5" and the new iPod touch. 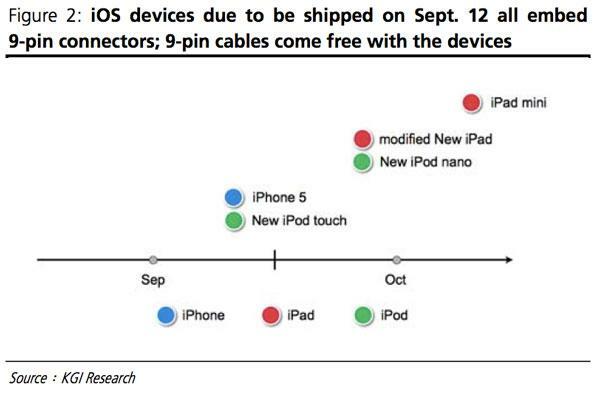 In October, Apple is also expected to launch a newly redesigned iPod nano, along with a tweaked new iPad largely unchanged other than support for the 9-pin connector. And also in October, Apple is expected to launch a smaller 7.85-inch iPad that will also feature support for the 9-pin design. Cable manufacturer Cheng Uei is expected to be the biggest beneficiary of the higher average selling price for the new 9-pin cables. Kuo has forecast that the company's cable sales will rise 48 percent year over year, representing 32 percent of Cheng Uei's sales in 2013.